Everyone’s who has been to an amusement park has seen a photo like this. You get off the ride and they have them on screens so you can check yourself out as the roller coaster took the big drop. 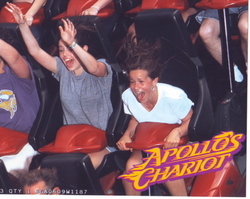 This is Jessica and Emily yesterday at Busch Gardens. We liked the image of Emily’s hair standing straight up so we decided to buy it. The women at the counter asked what size we’d like to purchase. I told her "send me a jpeg please". The girls laughed but I was dead serious. I was certain they’d just take my email address, charge me $5 or $10, and I’d see the email with the attachment in a couple minutes. But it doesn’t work like that. They can only sell you a hard copy. They should fix that.